To identify the root cause of connectivity issues it is necessary that the below tests are run on an affected machine within the Terminal. Select the magnify glass symbol in the top right hand corner of the screen. Type Terminal into the search field and select the terminal application as shown below. Terminal should open and look similar to that shown below. 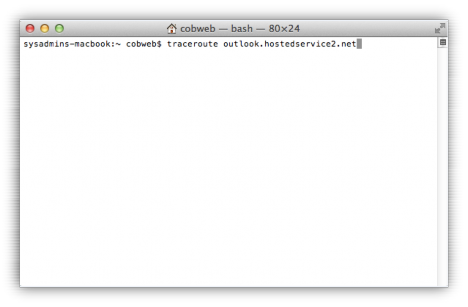 Within terminal we now want to run a Traceroute test to analyse the connection to your current Exchange platform. In order to run a Traceroute test you will need to type the command below that relates to your current Hosted Exchange platform. The command should looks similar to the one shown below. Once the command has been entered correctly press enter to start the test. This can take some time to run through depending on your connection speeds. Our Technical Support Team will require the full results to help diagnose the issue you are experiencing. The test is complete once you are able to type in the terminal window again. Please send a screenshot of the results to support@cobweb.com with your incident ID in the subject line. Print Screen - The print screen command allows you to copy and image of your entire desktop. This can be done by pressing the command key (cmd), shift and 3 simultaneously. The resulting image will then be saved as a file on your desktop. Snipping Tool - The Snipping tool allows you to copy a selected area of your screen. To access this feature you will need to press the command key (cmd), shift and 4 simultaneously. At this point you will be able to click and drag your cursor to take an image of a specific area. This image again will automatically be saved on your desktop.